Ozil revealed he would "no longer be playing for Germany" last month after accusing some German FA officials of racism. "His agent called me and told me that Mesut would announce his retirement," said Low. "The player himself did not call me. Ozil has chosen a different path and until this moment, he has not called me. "I have tried by phone and text message but I have not been able to reach him. I have to accept that, I probably underestimated the whole situation. "The topic has taken a lot of energy, but it should not be an alibi. The statement from Ozil was perhaps a bit hasty. There has never an approach of racism in our team." Ozil was criticised for posing for a photograph with Turkey's president Recep Tayyip Erdogan ahead of the World Cup in Russia, in which Germany failed to progress from the group stage. 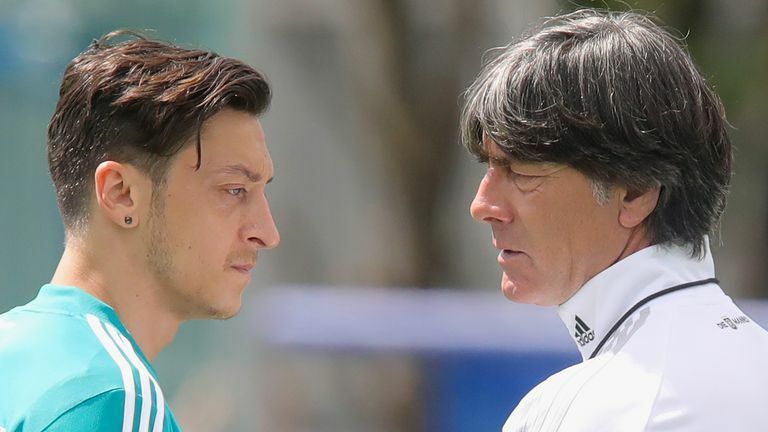 Germany team manager Oliver Bierhoff initially suggested Ozil should have been dropped after his failure to clear up the Erdogan meeting but the 50-year-old says he now regrets the manner of Ozil's retirement. "I have spent nine marvellous years with Mesut in the national team," said Bierhoff. "He's a great footballer and we have a lot to thank him for. How his retirement happened is regrettable. "We misjudged the situation of these emotions and also political reactions taking place. I have never seen opinions differ so much. "But one thing is clear: a national player must not become a target for racism."